Ships from and sold by Zuber CA. 5.0 out of 5 starsGOOD & GROSS! 5.0 out of 5 starsIt took less than 5 minutes to identify multiple problems! I had problems from an apple tree that came with the house. I had more than one visible problem on the leaves, and I was able within minutes to identify the separate problems appearing on their leaves. I then checked the plants section and there were the same diseases/pests listed. I cross-referenced with the other plants that had problems (some already dead and gone) and sure enough they matched up to the apple tree problems. The cures for my multiple problems seem to be solved by some Horticultural Oil that is recommended in the book. (Luckily I ordered some Monterey Horticultural Oil in a panic before I got the book - based on good old Amazon reviews again :) So yes, they lean towards organic remedies in the book, but really, spraying some of this Horticultural Oil on seems like not such a bad deal. In fact, it seems like more of the miracle spray for all of my problems than other avenues. I am definitely one of those that wants the miracle in the bottle. You should definitely buy the book before you buy another plant. Nurseries are generally great about listing any pest problems, but when you look up a specific plant or tree in this book, and then you look at the list of problems, it becomes very obvious what you are really getting yourself into with a new plant or tree. It might not be a bad idea to pick up some of the Horticultural Oil they recommend and do every living thing in your yard. Get the problems before they get the plants. The organizational structure of this guide to identifying and treating plant problems makes navigating the many causes of damage easy. The first section contains thumbnail photographs of specific problems, arranged by plant parts affected: leaf problems; stem and bud problems; flower problems; fruit, berry, nut, and vegetable problems; soil, root, tuber, and bulb problems; and lawn problems. The book then follows the problems with a brief photographic section of beneficial insects so gardeners do not kill off the bugs that help maintain environmental balance. Good gardening habits, including soil and nutrient analysis and pest/disease control, are given adequate space. The bulk of the book, however, is the A to Z guide which describes symptoms, cause, and control of just about every garden problem. Readers are expected to first identify the problem using the photographs in the beginning section and then turn to more information in the A to Z guide. The problem is, different plants with the same disease may not appear anything like the chosen (and small) photograph. Diagnosis is sometimes difficult. The index to individual plant problems is somewhat of a help to rule out similar problems that don't affect the plant in question, but I found myself wishing that this guide were a little more complete. I found that this book makes a good supplement to my other gardening books. 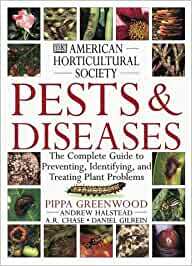 Very few books are dedicated to pests and diseases, making this a valuable resource for the gardener. I recommend pairing this book with Princeton University Press's Garden Insects of North America. I was overwhelmed by the quality of the pictures and explanations of what I was looking at. I couldn't put it down. And as a reference book, it works. I use it often. I recommend it highly, if your into gardens and flowers and trees, the stuff outside, and some inside. As a life-long gardener and amateur botanist, I've sought for years a book that gives me a complete rundown on all plant pests and diseases. I've had several other books that simply didn't cover everything, and taken together, still didn't do the job. This book from the American Horticultural Society now fills that void for me. 4.0 out of 5 starsGet answers for your plant problems. Hard to navigate in the book to figure out the problem with various plants. Did get answers in part going through several words in index. Do like that the book does have lots of pictures. Liked the Ortho Home Gardeners Problem Solver better.